Many of you joined us at St. Paul's Basilica in Toronto for an evening with The Priests. If you're not in Toronto or if you missed the live webcast, you can tune in this Sunday, December 20th, at 9:30pm ET for Harmony: An Evening with The Priests. The concert will repeat on Monday, December 21st at 1pm ET and Friday, December 25th, also at 1pm ET. Frs. Eugene and Martin O'Hagan and Fr. David Delargy also came to our S+L studio and sat in conversation with S+L CEO Fr. Thomas Rosica and Toronto Auxiliary Bishop-elect William McGrattan. 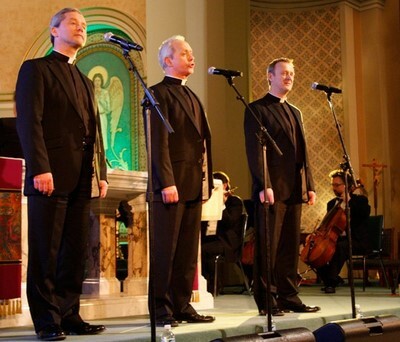 They spoke about music, the priesthood and about the Church's current situation in Ireland. It was a wonderful conversation and a perfect way to celebrate the priesthood, especially during this Year for Priests. That conversation will be airing the day before the concert. Tune in for A Portrait of The Priests on December 19th at 8pm ET. If you are not able to watch it then, it will repeat on Sunday, December 27th, at 9:30pm ET. For other re-broadcast times of both these programs, check HERE. And don't forget, you can always access our Salt + Light Television live streaming HERE.